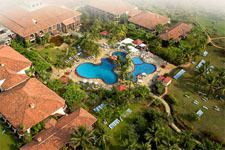 The Ramada Caravela Beach Resort, among Goa’s finest international beach-front hotels offers all the space one needs… for relaxation, romance, self-discovery, escape, excitement, rejuvenation, solitude, or sheer thrill. Located on the serene white sands of Varca beach – heralded as Goa’s cleanest beach stretch, the 202-room resort sprawled over 23 acres of refreshing green is an architectural treat. 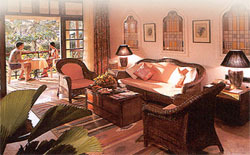 The 14 year old resort has been designed by Wimberley, Allison, Tong and Goo – the creators of the famous Sun City. 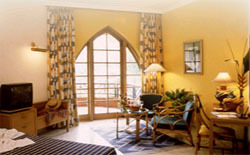 All the guest rooms, suites and villas are endowed with private balconies and a spectacular view of the ocean, overlooking lush landscaped gardens and Goa’s largest swimming pool. Every room has a tea coffee maker, individual safe deposit lockers, mini bars and electronic locks.